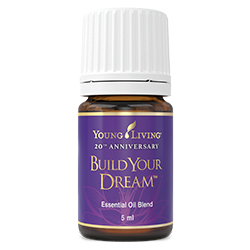 Combining essential oils chosen by D. Gary Young for their connections to the history of Young Living, Build Your Dream™ empowers and clarifies to help you find the way to achieve your dreams when used aromatically. Build Your Dream helps to open up intuition and inspire confidence, clarity and focus. This blend may increase self-confidence as it creates a peaceful, relaxing and calming atmosphere. This unique blend was formulated to capture Gary Young’s vision and entrepreneurial spirit, and celebrate 20 years of Young Living's success as a leader of Essential Oils. Use Build Your Dream to honour your entrepreneurial spirit and ease the stress of building your business. Apply to wrists, edge of ears, neck, or feet to inspire confidence, clarity and focus. Add this essential oil blend to a night-time moisturiser to support healthy skin. Use this soothing and uplifting blend to boost spiritual awareness and enlightenment for enhanced meditation. Lavender (Lavandula angustifolia) oil †, Ylang Ylang (Cananga odorata) flower oil †, Blue Cypress (Cllitris intratropica) wood oil †, Sacred Frankincense (Boswellia sacra) oil †, Hong Kuai (Chamaecyparis formosensis) wood oil †, Melissa (Melissa officinalis) leaf oil †, Idaho Blue Spruce (Picea pungens) branch/leaf/wood oil †, Balsam Canada (Abies balsamea) needle oil †, Royal Hawaiian Sandalwood™ (Santalum paniculatum) wood oil †, Coriander (Coriandrum sativum) seed oil †, Tangerine (Citrus reticulata) peel oil †, Black Pepper (Piper nigrum) fruit oil †, Bergamot (Citrus aurantium bergamia) peel oil †, Frankincense (Boswellia carterii) oil †, Juniper (Juniperus osteosperma) oil †, Anise (Pimpinella anisum) seed oil, Blue Tansy (Tanacetum annuum) flower oil †, Geranium (Pelargonium graveolens) flower oil †, Blue lotus (Nyphaea lotus) flower extract.